A dense handbook for students returning home or moving abroad for college, ‘Nomad’s’ Guide’ is written for TCKs facing a double transition -– adjusting to a new stage of life as an independent young adult while also adjusting to a new culture. Tina is a TCK herself — her family lived abroad for 15 years in Pakistan, Kenya, Switzerland and France. A cross-cultural trainer, writer and international speaker, she is on the Board of Directors of Families in Global Transition (FIGT). ‘Nomad’s Guide’ is comprehensive and thorough, and includes advice how to mourn the life left behind as well as practical tips on learning to do laundry before leaving home. The book encourages students to come out and say how they feel about the loss of their favorite house, best friend, status in the community and so on. “If they are allowed to put a name on the loss they will be able to openly grieve for it. The more time they spend on the ‘funeral,’ the more likely they are to come to acceptance of the loss and move on to a better place,” Quick said. She also thinks that creativity can be a potent healer – it might be a journal entry, a song, or a painting that helps the person connect with their feelings about the loss. Quick says that only a few international schools prepare their students with these talks and seminars – and even those schools who do have such programs find that students do not attend, especially if such sessions are optional. 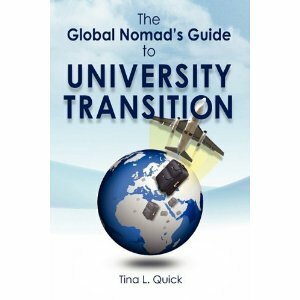 The Global Nomad’s Guide to University Transition is available on Amazon.com. Previous PostWorld Cup: What country do you support?